BROOKLYN ENGINE COMPANY NO. 8. Left to right: Sam'l Burns, Alexis Levigne, John Virtue, John A. Gillen, Thomas P. Connolly, Jas. Bridges, Jas. H. Quinn, Wm. Schiebel, Wm. Dolan , Jos.G. Green, Bartley Gunning (up in the seat), Francis J. Quayh, John McCole (Asst. Forman), James Walsh (Dist. Eng'r, late Forman (inset). "Harry " and " Jim," are the two fine dapple bay horses. COMPANIES OF THE THIRD DISTRICT. Their first engine was a U tank. This was soon found to be too small for the work required of it, and it was exchanged for a Clapp & Jones steamer. Two years later this was replaced by an Amoskeag engine, one of the first introduced in the Department. At the present time they have a first-class Amoskeag, which weighs 8,100 pounds. Harry " and " Jim," two fine dapple bay horses, furnish the locomotive power when the engine is in transit to and from fires. Tom," a chestnut sorrel, seventeen hands high, rattles the two-wheeled hose-cart along with surprising speed. The first big fire to which the company was called was at Conklin's lumber yard, which covered nearly the entire block bounded by Pearl, Plymouth and John Streets. The loss was over $200,000. On May 10, 1872, the company worked twenty hours on a fire at the sugar refinery, foot of Gold Street. The loss was $300,000. mer of 1875, they did some excellent work at Baxter's paint works on Jay Street. Among the other large fires at which No. 8 rendered valuable services, were those at the Averill Paint Works, on Water Street on Dec. 6, 1872; at ex-Alderman Ruggles's wall- paper and button factory, on Oct. 21, 1884; in the Equipment Department at the Navy Yard, on Jan. 6, 1888; at the carpet works at Front and Washington Streets on Jan. 6, 1883; at Campbell & Thayer's linseed oil factory on Pearl Street, on May 13, 1877; at Harbeck's stores, Nov. 13, 1884, at Haverneyer's sugar refinery in 1882 ; at Pond's Extract factory; at the Brooklyn Oil Refinery ; at the Gowanus Oil Works and E. B. Bartlett's Central grain elevator, Nov. 13, 1888. The damages at these fires ranged from $100,000 to $800,000 One of the worst fires with which the company had to contend was in the Arbuckle Coffee and Spice Mills at the foot of Adams Street in 1883- For eighteen hours they battled with the flames. It was a stubborn fire, and the fight was against the brave men, who never left their post until the building was burned to the ground. In their work at this fire several of the men had their hands badly cut by falling glass. The damage to the building and stock was estimated at $200,000. A paper box factory which stood on the same site had been burned in 1881. The company also did some excellent work at the fire at the Pierrepont stores, on Sunday, Jan. 26, 1890, when the full-rigged iron ship " Pythomene," laden 'with jute butts and linseed meal, was totally destroyed. On that occasion several firemen came very near to being suffocated. From the date of its organization until July 18, 1892, a period of almost twentythree years, the Foreman of No. 8, was JAMES WALSH. The proper place for a sketch of his life is now among the District Engineers, and his services will be found chronicled as the responsible chief of the newly created Tenth District, of which he was placed in command when he was promoted on the above date. But the history of No. 8 would be incomplete indeed without mention here of the long service as its Captain of District Engineer James Walsh. Assistant Foreman JOHN McCOLE Pending the appointment of a successor to Foreman Walsh, the command of the company devolved on Assistant Foreman JOHN McCOLE, who was born in Ireland on March 7, 1837. He is married, and is the father of eleven children, four of whom are living. He lives at No. 113 Jay Street. As a member of the Volunteer Department, he had some thrilling experiences while attached to Constitution Engine NO. 7. He is a retiring man, and dislikes to talk about himself, even to his most intimate friends. Although he never has been injured in the discharge of his duty, it has been through good luck, for he has many times been in perilous positions while doing his part toward saving valuable property. He severed his connection with the Volunteer Department Oil Sept. 15, 1869, when he received his appointment to the Paid Department and was .assigned to duty with Engine No. 8. His valuable services as an ordinary fireman, and strict attention to duty led to his promotion to the grade of Assistant Foreman on March 1, 1887. Driver BARTLEY GUNNING sits on the driver's seat of Engine No. 8 and guides the horses "Harry" and " J im." He was born in Ireland, on May 10, 1846, and was appointed to the force on Sept. 15, 1869..
JOSEPH G. GREEN was born in New York City, on March 14, 1840, and was appointed to the force Aug. 15, 1870, and assigned to duty with Engine No. 8, in the capacity of engineer. He is at present detailed at the Repair-shops. ALEXIS R. LAVIGNE was born in Lowell, Mass., on NOV. 2, 1857, and became a member of the Fire Department on Sept. 17, 1883. He is detailed at present as lineman at Fire Headquarters. WILLIAM SCHIEBEL was born in this city, on Oct. 27, 1868, and was appointed a fireman oil Nov. 16, 1891..
THOMAS P. CONNOLLY was born in England on Dec. 26, 1853, and entered upon his career as a fireman Feb. 1, 1887. Prior to becoming a member of Engine No. 8, lie did duty with Engine Company No. 5. JAMES BRIDGES was born in this city, on NOV. 26, 1870. He is a fine stalwart young fireman, and his ambition undoubtedly will receive its reward in due time. He was appointed Nov. 15, 1891. JAMES H. QUINN also was born in this city, his natal day being Oct. 27, 1864. lie became a fireman on May 20, 1889. JOHN VIRTUE hails from Boston, Mass., in which city he was born on April 7, 1856. 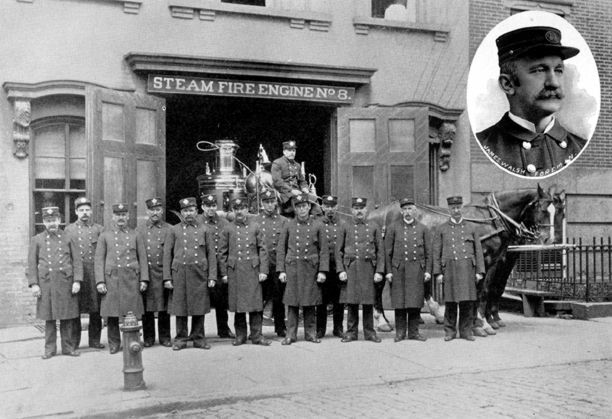 It was on June 19, 1882, that his name was enrolled on the blotter of Engine Company No. 8. He is a thoroughly efficient fireman. This completes the roll of membership of Engine Company No. 8. They are, all, in all, a fine body of men, and their standing in the Department as a company is A I. They have done good work and are ready to do more, no matter how perilous it may be, whenever the big gong in the engine-house summons them to battle with the flames.